Just yesterday, while writing about the new poster for Bridesmaids, I remarked that I was sick of female-driven movies reduced to being "about a workaholic who believes she has no time for a man in her life before meeting Mr. Right." 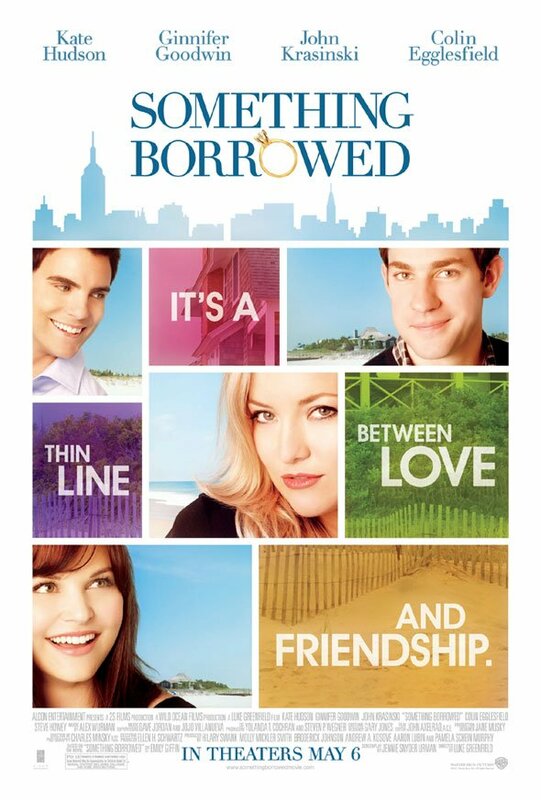 In the new Luke Greenfield movie, Something Borrowed, Ginnifer Goodwin plays a high powered, single attorney who ends up sleeping with the guy she's had a crush on since law school (Colin Egglesfield), who also happens to be the fiancee of her best friend, played by Kate Hudson. One step forward, three steps back, I suppose. Anyway the movie has a new poster. It's entirely possible that the film will be one of those that takes a tired concept and ends up somehow putting a refreshing spin on it, but considering that the movie also has John Krasinski playing Goodwin's friend who has "a secret" (how much do we want to bet that he's in love with her?) and Steve Howey playing a stereotypical womanizer, I don't really see that happening. Check out the new one sheet below or full size over in the Blend Film Database.